Donors are often a close relative such as a parent, brother or sister, son or daughter but may also be individuals who are not related but have an established emotional relationship with the recipient such as a partner or close friend. Sometimes a donor and a recipient may be incompatible with each other because of blood group or tissue-type and in this case it may be possible for them to be paired with another donor and recipient in the same situation. This means that each recipient will benefit from a transplant that they would otherwise not have had (this is called paired donation). Donors may also offer to give a kidney to someone who is on the waiting list for a transplant but whom they have never met before (this is called non-directed altruistic donation). You will have a thorough medical and surgical and psychological assessment to establish that you are fit and healthy to donate. A number of people who wish to donate find that they are not able to do so because health problems are discovered through the assessment process. Members of the healthcare team involved in your assessment include counsellors, coordinators and social workers. Gary has chosen the Northwestern Memorial Hospital Kovler Organ Transplantation Center. For more information you can call 312-695-0828. While it is commonly family members who offer to be kidney donors, there are often spouses, friends, members of the community, or people from the same place of worship who can be highly successful kidney donors. Being related is not a requirement to donate a kidney. All operations carry some risk and this is no different for living donation. Donors are at risk of infections (e.g. chest, wound or urine) and, more rarely, bleeding or blood clots. There is a very small risk of death for the donor: this is estimated at 1 in 10,000 for this operation. There is a possibility of a rise in blood pressure and excess protein in your urine. 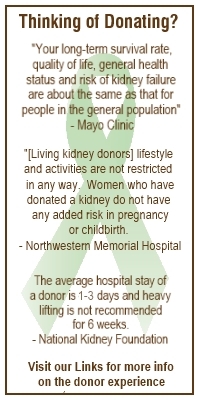 However studies have shown that there is no long-term effect on the health of the donor or your remaining kidney. Will I be covered by my health insurance? You should check with your insurance company. If there is more than one transplant hospital in your city, insurance might not allow you to go to both. However, Gary’s health insurance will cover the costs of the donor’s evaluation and transplant. What if I live in a different part of the country from the person I am donating to? You can still donate. The transplant team can arrange for your donor assessment to take place at a hospital near you if that is more convenient for you. Usually the donation will take place in the hospital where the person you are donating to is cared for. However, different arrangements can be made depending upon individual circumstances for both the donor and recipient. There are organizations that could help you with the travel and living expenses. This varies. You should check with your hospital. In general, this will take approximately two to six weeks. There is variation depending upon where you live and what tests you may require. Wherever possible, the assessment is tailored to your needs and commitments. Most transplant centers will try to arrange the tests before the operation around your work schedule to minimize disruption to your job. It is sometimes possible to arrange for some of this to be done locally if the donor lives a long way from the transplant center. The operation and recovery period varies depending on surgery, your individual recovery and the type of work you will be resuming. Many people that have a desk job are back to work in three weeks. If your job is physically demanding, you might need six weeks or more to resume all your prior activities. This varies depending on your individual recovery. Many donors only spend one day in the hospital. It is not uncommon for someone to have to spend 2 or 3 days in the hospital to recover. You will need to take some painkillers immediately after the operation and during the recovery period. However, you should not need any long-term medication as a result of kidney donation. Your coordinator at your local transplant center should be able to arrange this for you. Also, ask about the Living Kidney Donors Network Mentors Program. In addition, Brian Kunz, a BJBE congregant, has graciously offered to speak with any prospective donor for Gary. Brian can be reached at kunzbrianj@aol.com. You have the right to withdraw your offer at any time and you would be supported in your decision by the transplant team.